A Vilnius building that belonged to the Freemasons in the 15th century, and which over the next five centuries endured and survived numerous fires, not to mention a slew of alterations dictated by the changing aesthetics of successive eras, has yet again been freshly refurbished to fit the needs of the 21st century. Located on one of the neighborhood’s main streets, which sees daily traffic from both locals and tourists who’ve come to see the city’s historical UNESCO gems, the venerable building is now home to a hotel. 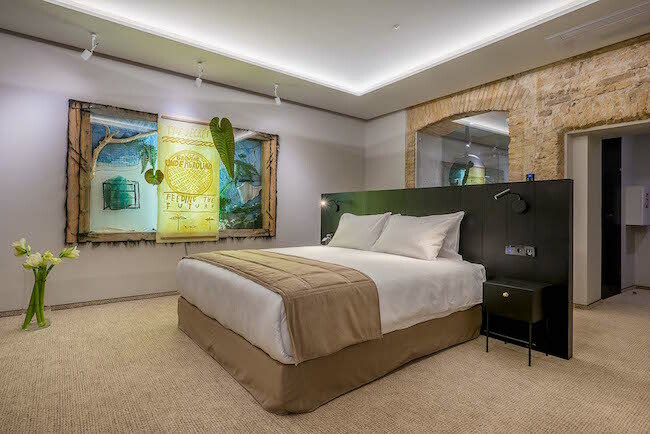 The hotel has been designed with the main amenities that today’s discerning guests expect – a breakfast made with pure and healthy ingredients, exceptional beds, fast and free Wifi, and culture; but in this case, the latter is an outright art experience. 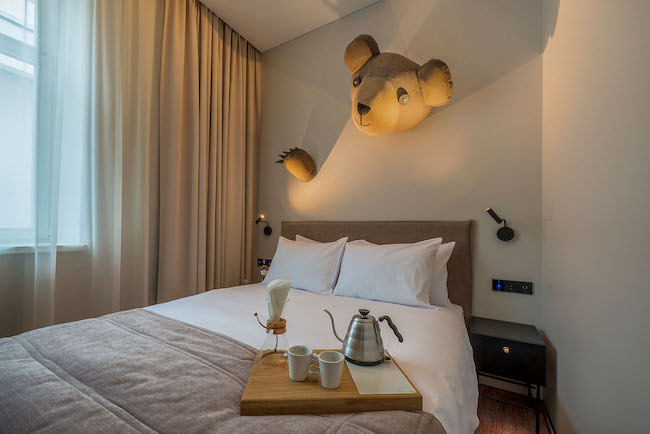 One can’t help but notice that the name of the hotel – Artagonist – already contains an allusion to challenging the mediocrity of daily life with the aid of an arsenal of art. Artagonist has been created as a contemporary art hotel filled with works specially made by Lithuanian artists for the hotel’s collection. 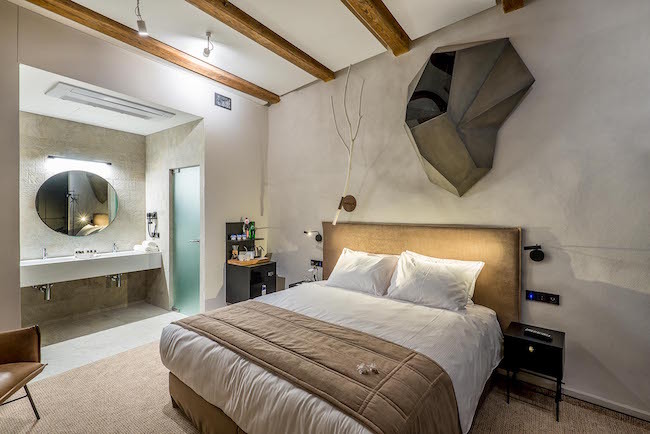 Throughout the hotel’s thirty-four uniquely different rooms, focus has been placed upon artworks done in the genres of sculpture, installation, textile art, and painting. However, in the hotel’s public spaces (reception, lobby bar, breakfast room), wall murals have been made the main accent. Thestand-out here is the work “No Walls”, by J. Tarabilda, in the reception area – spanning the height of the hotel’s atrium, it surprises by continuing all the way down to the basement-level restaurant in the form of a man’s legs with rolled-up jeans and sneakered feet. 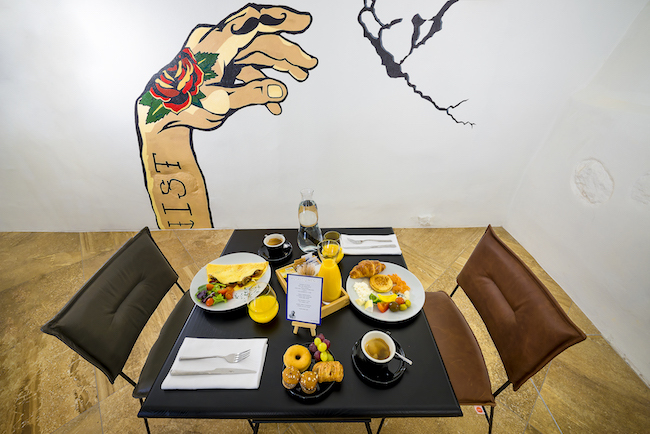 In a sense, it’s an interpretation of the Antagonist hotel itself as guests are greeted by this rebellious, slightly hipsterish figure with naively romantic tattoos.